Hang Dai Editions is honored to partner with Christopher Irving of The Drawn Word and Graphic NYC to present an exclusive 13-piece trading card set featuring twelve perennial cartoonists photographed by the late Seth Kushner, and a portrait of Kushner photographed by his good friend, Carlos Molina. 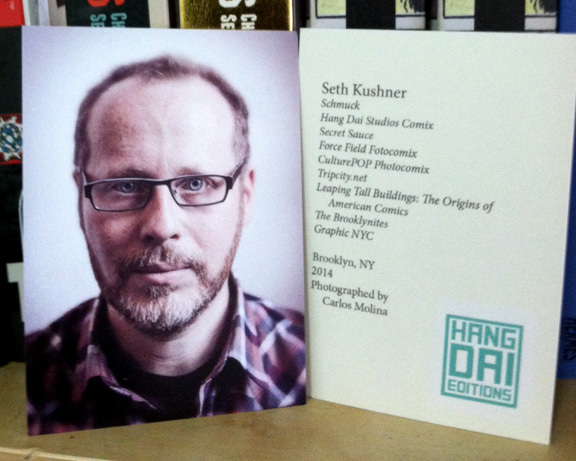 As a benefit and tribute to the late comic book writer/photographer Seth Kushner, a set of 13 cards have been published to benefit Seth’s wife and son. Published by Hang Dai Editions through Christopher Irving’s The Drawn Word, the cards feature creator signatures in a limited run. The cards will debut at Small Press Expo (Sept. 19-20) at the Hang Dai table (#w35) with Kushner’s partners Dean Haspiel, Gregory Benton, and Josh Neufeld. The cards retail for $15 a pack, and $25 for a pack with a single creator signature. 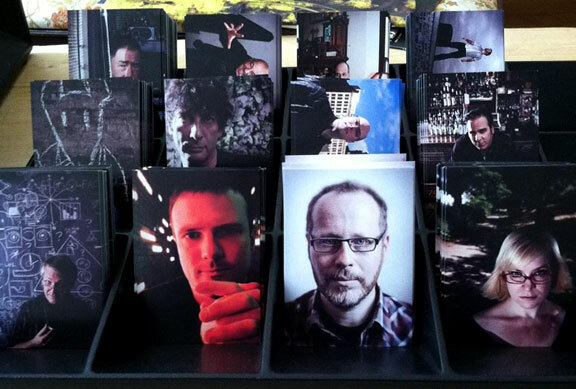 Twelve creators are showcased in the set, with the thirteenth card a Seth Kushner card, using a photo portrait by Seth’s longtime friend Carlos Molina. The creators are Neil Gaiman, Becky Cloonan, Art Spiegelman, Chris Ware, Dean Haspiel, Molly Crabapple, Larry Hama, Scott McCloud, Jimmy Palmiotti, Brian Michael Bendis, David Mack, and Alex Ross. 100% of the proceeds go directly to Terra and Jackson Kushner. Only five fully-autographed sets will be auctioned off, with details to come. The Graphic NYC Cards will be sold at the Hang Dai booth at both SPX and the Baltimore Comic Con. Remaining stock will be sold through Irving’s The Drawn Word. Direct contributions can be made to the Kushner family through their gofundme page. Also, Hannah Means-Shannon conducted a great interview with Chris Irving about the trading card project at Bleeding Cool. This entry was posted in Uncategorized and tagged Alex Ross, Art Spiegelman, Baltimore Comicon, Becky Cloonan!, Bleeding Cool, Brian Michael Bendis, Carlos Molina, Chris Ware, Christopher Irving, David Mack, Dean Haspiel, Graphic NYC, Gregory Benton, Hannah Means-Shannon, Jimmy Palmiotti, Josh Neufeld, Larry Hama, Leaping Tall Buildings, Molly Crabapple, Neil Gaiman, Scott McCloud, Seth Kushner, SPX, The Drawn Word. Bookmark the permalink.